If you want to see a couple of glaring examples of how Marvel tried to “play it down the middle” in terms of racial politics, check out a couple of silver-age Avengers tales that both feature the Sons of the Serpent. The funny thing is, they didn’t have to play it that way. In the racist villainous group’s debut (Avengers #32-33) they rough up people who “shouldn’t be” in certain neighborhoods and generally those of any foreign lineage. They eventually attack (black) Stark employee Bill Foster (his first-ever appearance) which leads Earth’s Mightiest to get involved. Interspersed between panels is the arrival of General Chen at the United Nations, a communist strongman from a never-divulged country. To make a long story short, it’s revealed at the end of Avengers #33 that Chen himself was the “Supreme Serpent,” whose intent was to “make Americans distrust each other — and then hate each other! 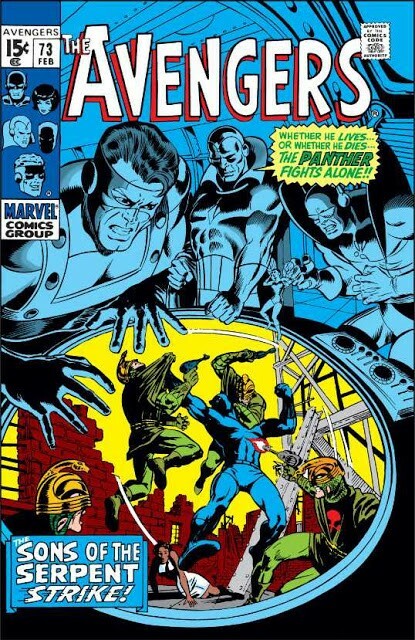 Fast forward to Avengers #73-74: The Serpents are back, and this time they’ve taken the Black Panther hostage! Not only that, they fool the country into believing the Panther has joined their cause! 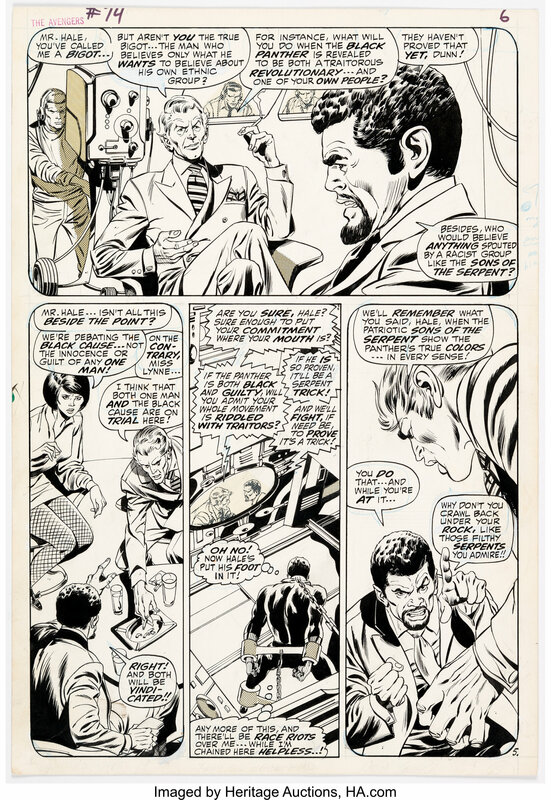 The racial drama quotient is further elevated in this tale as writer Roy Thomas makes use of a bigoted talk show host (Dan Dunn) and a black radical (Montague Hale) discuss the topics of that era … but it’s left the Avengers to offer the centrist commentary. At any rate, like the tale before it, the Serpents aren’t led by an actual white supremacist … but by Dunn and Hale themselves! I’ve noted previously how Marvel under Stan Lee’s tutelage was much more neutral on controversial issues than the company is today; ironically, in these two stories — from 1966 and 1970 respectively — the company had no reason to. Marvel certainly could have made the Serpents a straightforward KKK analogue given the times, and though I was a youngin’ at the time, I doubt there would have been much controversy. After all, the very themes and dialogue already were well represented in both storylines. Captain America beats up members of a white supremacist militia called the Sons of the Serpent as they attempt to apprehend a group of illegal aliens crossing the desert from Mexico into Arizona. The leader of the group, the Serpent Commander, makes statements that are similar to what Republican presidential candidate Donald Trump has been criticized for saying during his White House run. The Commander longs for the construction of “the mighty wall” and laments the “trouble and disease and crime” that the border-crossers are bringing with them. Indeed, Spencer — who openly displayed his hatred of Republicans on social media — took a complete 180-degree approach from the previous Sons of Serpent stories. There’s no argument that hating somebody merely because of their skin color is pathetically stupid, as told in Roy Thomas’s SoS tales; however, Spencer used a very legitimate political debate topic — illegal immigration — to brand one of the major political parties (and its supporters) as xenophobes and racists. I can imagine Spencer and his similarly minded SJW brethren using General Chen’s quote from above to make the “case” that Donald Trump was (and is) doing just that — creating a “fearful nation.” This, of course, overlooks the “illegal” part of “illegal immigration,” not to mention that tens of millions of such immigrants somehow isn’t a political and social concern. 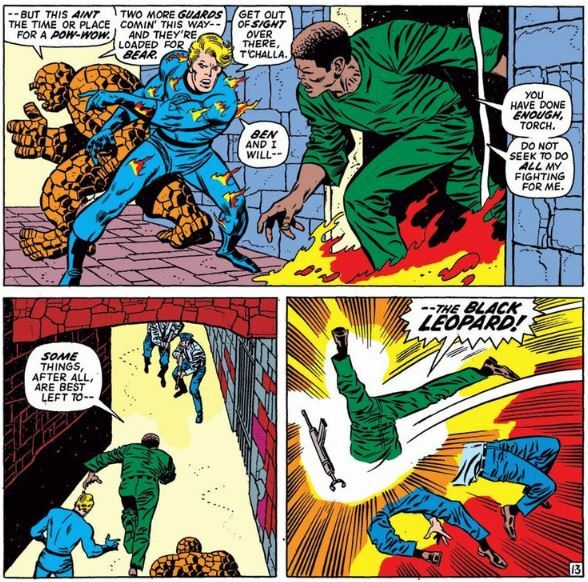 Further, I’d surmise these modern “progressives” would berate T’Challa’s decision to temporarily utilize the moniker “Black Leopard” as he did. Indeed, just look at what Ta-Nehisi Coates did in Black Panther and the Crew.